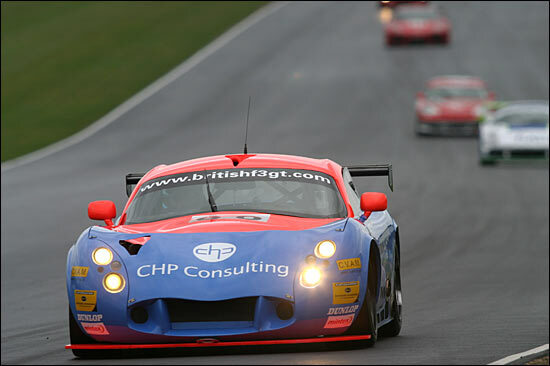 A wet and windy Donington Park met the new look for 2004 Eclipse Motorsport team, for rounds one and two of the British GT Championship. 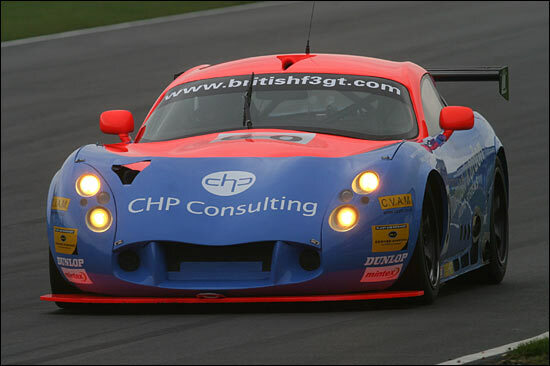 Well there’s a new look driving squad, with Piers Johnson joined aboard the TVR T400R by Steve Hyde. 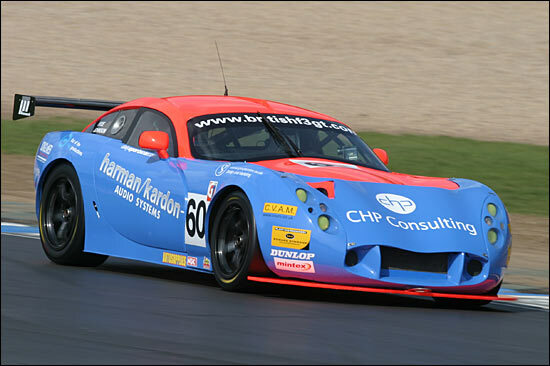 And the TVR too has a new look, with a new livery and a new race number. #69 becomes #60 for 2004. The livery will have a change of appearance next time out, at Mondello Park, because the blue paint applied to the lower reaches of the car is not the shade intended. The car will appear in Ireland in a darker shade, which should better complement the trademark Eclipse orange. So could the team’s 2004 efforts match their fabulous 2003 season? The opposition’s challenge’s are even more more serious this season, with a high quality 14 car N-GT class grid lining up in the Donington Park pitlane. Also new for 2004 is a new race format, with each race weekend hosting a double-header: Practice, Qualifying and Race One on Saturday, Race Two on Sunday. Qualifying is now a fast blast, with each driver getting 15 minutes in the car, in separate sessions. The first qualifying session dictates both the grid and the starting drivers for the first race and the second….well, you get the idea! It would be Steve Hyde first up and a solid session saw him fourth on the grid, fastest of the TVRs, behind polesitting Mike Jordan in the JWR Porsche, Nathan Kinch in the brand new Scuderia Ecosse Ferrari 360 and David Jones in the Preci-Spark JWR car. Session two would be altogether harder work for the drivers and pitcrew, the cars starting the session on a dry track but then meeting driving rain as they completed their first lap. Most runners opted to pit straight away for inters or wets but then, as quickly as it had arrived the rain disappeared and the track started to dry almost immediately. For most this meant a second tyre stop: “It was our two stop strategy” joked Eclipse’s stalwart spannerman Graham Campbell. The usual fluid teamwork made light of a busy 15 minutes and Piers made it a matched pair of fourth places on the grid, the visiting (ex EMKA) Vic Lee Racing Porsche setting pole ahead of the brand new GruppeM 911 RSR and Tim Mullen’s 2003 spec Scuderia Ecosse Ferrari 360. The team opted for slicks but even on the lap out to form up for the grid it was obviously the wrong choice. "It was slippery as anything out there," said Hyde. The team got the message and prepared to change tyres on the grid but were foiled by confusion further down the line, which led to a delay in the #60 car reaching its allotted slot. 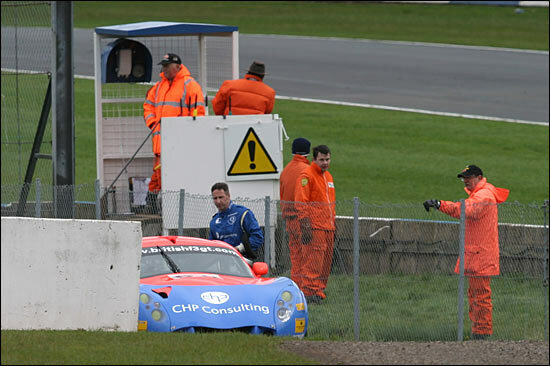 By the time the TVR reached the second row of the grid the 30 second board was out and the team knew they were in trouble. In those conditions a trip off the circuit was almost inevitable - Hyde radioed in during his moment skipping through the gravel trap whilst telling the team "I think that was one of the best saves of all time!" The TVR had fallen out of contention and the proof of the correct tyre choice came as early as lap seven when the Eclipse car was lapped by Mike Jordan’s intermediate shod Porsche. From then on in it was a matter of damage limitation, a frustrating run to the pit stop window and then more of the same from Piers Johnson, with a steady run to the flag. 11th place (9th in N-GT) a poor reward for their efforts. Other teams had equally frustrating starts to the 2004 season, but at least with the new, twin-race format, everyone has two opportunities to race: Sunday’s 60-minuter just had to be more satisfying than Saturday’s, didn’t it? 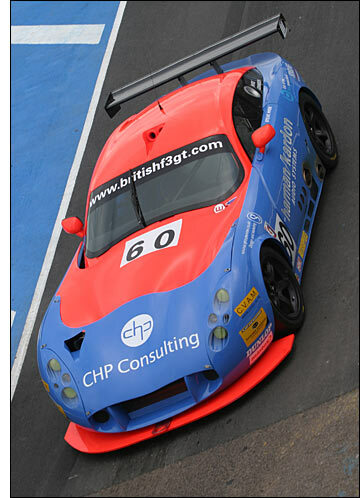 Piers Johnson was at the wheel of #60 for the start of Race Two and this time the weather looked more predictable. It was sunny, but with a stiff cool breeze. Most importantly the track was totally dry and tyre choice was slicks all round: this would be a sprint race in it truest sense. The race was an absolute cracker, with bunches of cars dicing for position, making up places and then losing out as other cars surged through. Piers was soon joined in battle with the brand new RSR Motorsport TVR T400R of Nigel Greensall, the two distinctly differently shaded TVRs battling over seventh spot. Piers kept the Eclipse car well in contention, bringing the car up to sixth overall as the pit stop window appeared and now it was Steve Hyde’s turn to join the chase. 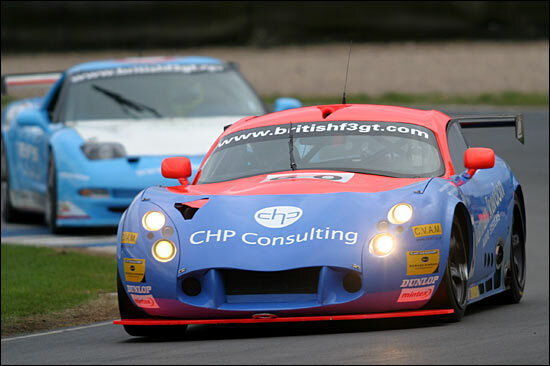 Hyde too was now finding the pace that all Eclipse watchers know is in the car and he was soon joined in a battle for position with his ex team-mate Richard Stanton, in the 2003 championship winning Mosler. 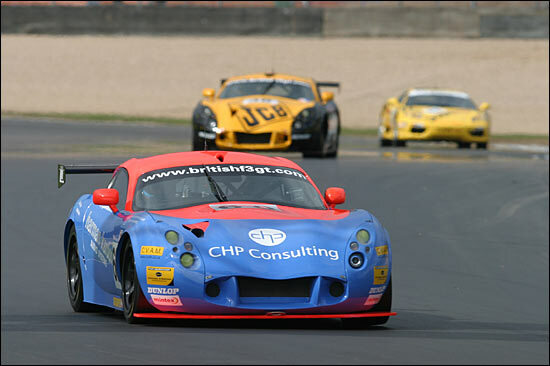 With the now DeWalt liveried car running the proper restrictors in 2004 the well fettled TVR soon put its challenge to the sword, and Hyde set off in pursuit of Kinch’s Ferrari, just four seconds ahead. This was a very promising looking run indeed, and a great finish looked on the cards. It was not to be however, the car suffering a sudden transmission failure, with no warning of impending doom. Steve pulled the car off the track and trudged home. This was one of those “Could have, should have” races: as others hit problems, a podium finish (top of?) would have beckoned…. 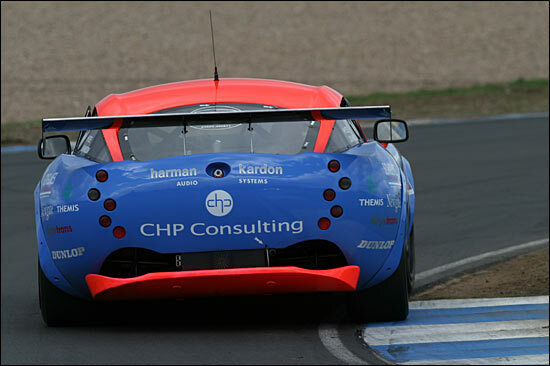 Race Two was eventually won by Nathan Kinch in the Ferrari, which the Eclipse car was reeling in just before the race ending problem. What could have been, this weekend? We’ll find out next time out at the Championship’s first ever visit to Mondello Park, in the Republic of Ireland.